Why Buy A Cambodian SIM Card? I’m no stranger to buying a local SIM card when I travel. I’ve purchased travel SIM cards in the USA, Vietnam, New Zealand, the Philippines and Indonesia. Roaming charges can be astronomical and horror stories of folks returning home to $1k+ phone bills are not uncommon. I changed mobile phone providers just before my recent trip to Cambodia and I thought I would have another quick look to see if roaming was a viable option. It wasn’t. I’m on Amaysim’s AUD$30 a month pre-paid plan which gives me 10GB of data. Amaysim has different rates for data while roaming in each country and in Cambodia it would have cost me AUD$0.50 per MB. It doesn’t sound like much when you say it like that, but that’s a whopping AUD$500 per GB. AUD$500!!! I know a lot of Aussies on Vodafone plans use the AUD$5 a day global roaming when travelling to one of the 80 countries included. Cambodia is on the list, but there is a catch. The AUD$5 doesn’t actually give you any additional data, call or texts, it just allows you to use your current plan while travelling. If you go over the amount of data allowed for in your plan in Cambodia it will cost you AUD$10 a GB for the extra you use. It’s even more expensive for those on Vodafone pre-paid, where a 7 day roaming add on is AUD$35 and only comes with 250MB data with calls/text or 500MG of data alone. I tend to use more data while away then I do at home as I’m constantly looking up directions, researching things to do and of course checking in on Facebook. My typical usage while travelling is 1 – 2GB per week. Had I decided to use my roaming, I would have been up for just under a grand in roaming charges. Free WiFi is of course an option and most hotels in Cambodia offer this to in-house guests. You can also sometimes snag it in restaurants, bars and attractions here and there. If you only need to be online sporadically, you could get by using free WiFi in Cambodia, but why would you want to? It’s so much more convenient to have the power of the internet in the palm of your hand 24/7 and when a SIM card in Cambodia will set you back as little as USD$2 you would be crazy not to take advantage. There are 4 main providers of Cambodian SIM cards; Metfone, Smart, Cellcard and qb. Each offer various travel sim card packages starting at just $2, but for ease of comparison I focused on plans around the $5 mark. Some providers will also charge you a dollar or two for the Cambodian SIM card itself if you don’t already have one. I ruled out qb as they don’t offer 4G/LTE. Smart have a good offer if you are interested in talk and text as both are unlimited. There is only 2GB of data included, but you do get unlimited data to use on certain social media. Cellcard Cambodia offer a generous 8GB of data over 30 days on their XG6 plan which is great for those in Cambodia longer. Add $3000 value of calls and texts and it’s a pretty sweet deal for USD$6. The deciding factor for us in choosing Metfone Cambodia over Cellcard Cambodia was convenience. 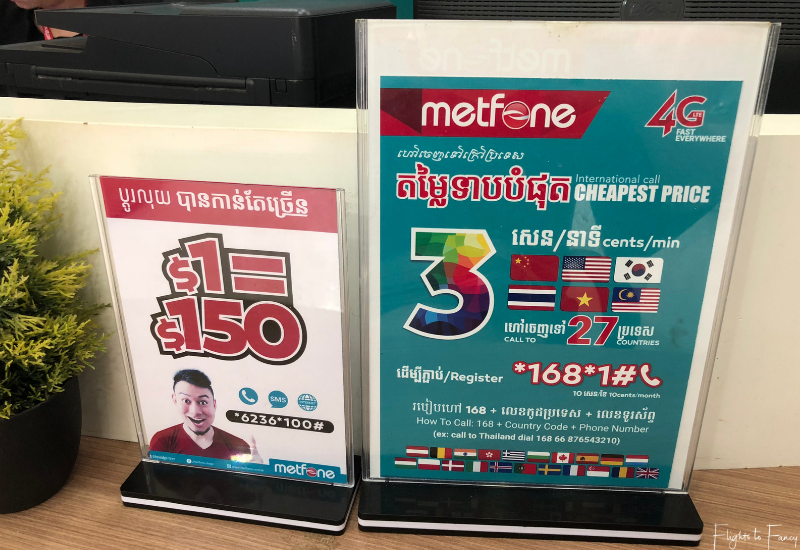 Both were the same price, both offered enough data (but Metfone’s is unlimited), both offer some calls and texts (not that we needed them) and both had sufficient time for our 7 day trip. Ultimately it came down to the fact that Metfone Cambodia was right across the road from our hotel The Park Hyatt Siem Reap and that’s tough to beat. Oh and did I mention that Metfone Cambodia has over a 50% share of the market? Over 7 million subscribers can’t be all wrong. We bought our Metfone Cambodia SIM card from the showroom at SIE02-Svaydongkom in Siem Reap, but you won’t have to go far to find a Metfone Cambodia office. With over 87 showrooms and 200+ agents across the country, there is never one far away. Travellers flying into either Phnom Penh or Siem Reap airports will be glad to know they can pick up a Metfone Cambodia SIM card at the terminal. For those that need data to order a ride through Grab Cambodia it’s especially convenient. Our first stop in Cambodia was in Siem Reap. We flew from Ho Chi Minh City to Siem Reap on Cambodia Angkor Air and touched down around 9.30am. 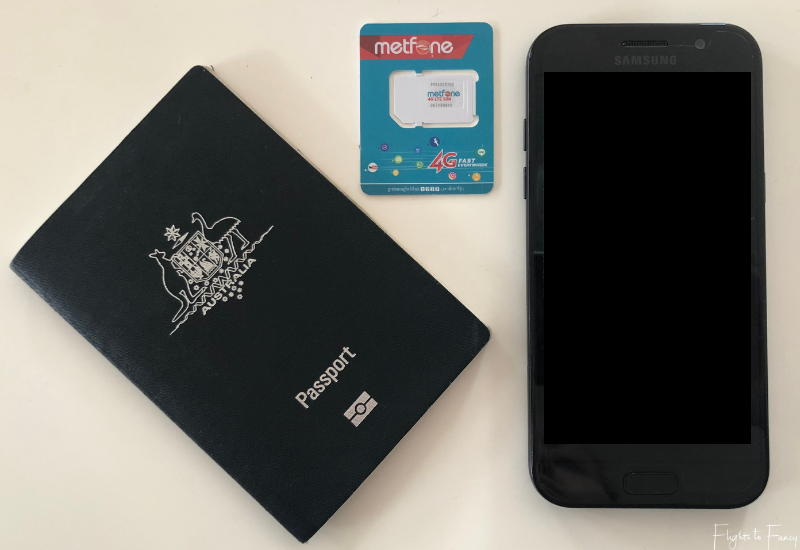 We thought about buying our Metfone Cambodia SIM card at the airport, but we didn’t want to keep our driver waiting and figured it could wait until we got into town. Shortly after settling in, we made a beeline for the nearest Metfone Cambodia office. The store was quiet when we arrived and there was only one other person in front of us. We decided to peruse the information on display while we were waiting. Metfone Cambodia offer a tonne of plans and quite frankly it was rather overwhelming trying to figure out which would suit us best from the sign on the wall. Especially since most of it was in Khmer. So we just asked which would work best. 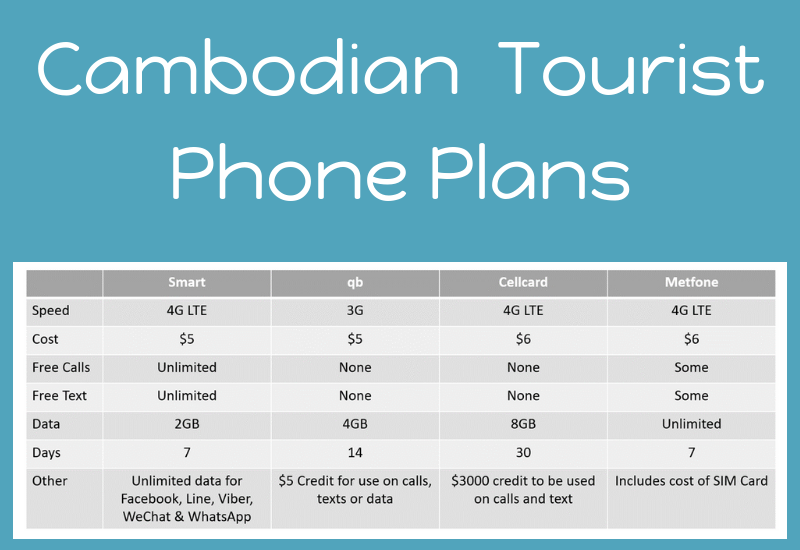 We were offered a USD$6 Cambodian SIM card with unlimited data. Sold! We had originally planned to just buy one card and tether, but for that price we splurged and got one each. We were required to show our passports as Cambodia has strict requirements for purchasing SIM cards to combat crime. Folks that purchase a Cambodian SIM card without ID risk getting their service deactivated and retailers risk arrest for non-compliance. Once we handed over the money, the helpful staff set up our phones and tested them. The Hubs’ worked perfectly first go. Mine was problematic and they couldn’t get my phone service working. I wasn’t too fussed as the data was functioning and I figured we could use The Hubs’ phone for the odd call we would need to make. 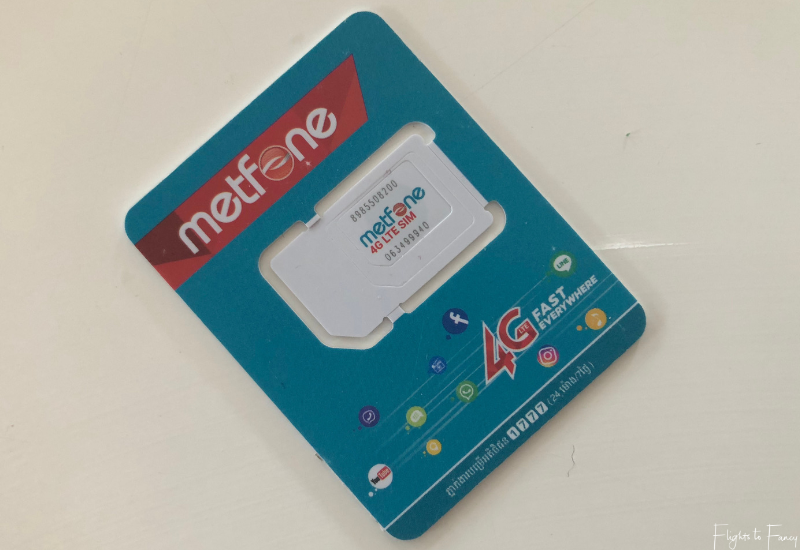 We used our Metfone Cambodia SIM cards throughout Siem Reap and Phnom Penh and the only outage we had was on the return journey from our Siem Reap Angkor Wat temple tour and it was only briefly. I’m all about travelling in luxury for less. I advocate there is a time to save and a time to splurge. I find roaming fees to be a ridiculous waste of money. Those dollars could be better put towards a stunning 5 star hotel like the Raffles Hotel Le Royal in Phnom Penh. Cambodia is the sixth country where I have purchased a local SIM card on my travels and I couldn’t be happier with how easy it has been and how much money I have saved over the years. Trust me on this one. 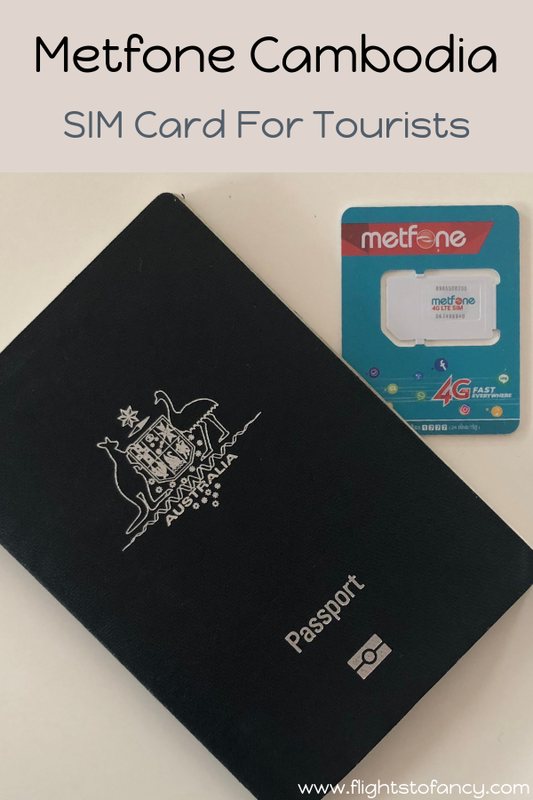 Get yourself to Metfone Cambodia and pick up a Cambodian SIM card as soon as possible after touching down, your wallet will thank you for it. If you are in the process of planning your trip to Cambodia make sure you check Agoda. I find they have the best prices on hotels in Asia and I use them almost exclusively to book my accommodation. Do you purchase local SIMs when you travel? Have you ever had any issues? I would love to hear your thoughts in the comments below. Disclosure Statement: This post is not sponsored. I paid for my Metfone Cambodia SIM card in full. The information in this article is based on my own personal experiences and has not been influenced in any way by the brand(s) featured. This post may contain affiliate links which if clicked may earn me a small commission on purchases at no extra cost to you. Allison Smith, my son is going to Cambodia. We are from US. His phone is not unlocked so I can’t just get a SIM card for him to use in his phone. I’m looking at Huawei Mobile Wifi and buying SIM card there to put in the wifi router, and then he would just connect to the wifi…not really interested in phone calls, but just data. Do you think that Metfone card would work for this? It sounds possible Cameron but I would check with them before you purchase. You could also get a cheap unlocked phone and out the SIM in their and tether the other phone. Often when The Hubs and I travel we just purchase the one SIM and tether because we don’t need the phone calls either but the downside is we always have to be together which won’t be an issue for your son. This is a very helpful post on having a local SIM in Cambodia. As during my International travel, getting genuine SIM card is very tough and sometimes they are not fulfilling our needs like less outgoing calls or data packets used up very fast. As Metfone is giving unlimited data offer then I would also purchase it as there is no need of local calls and texting for tourists. I too love the idea of traveling in luxury while spending less and saving few bucks in small things is always a wiser option. This indeed is a very helpful post. 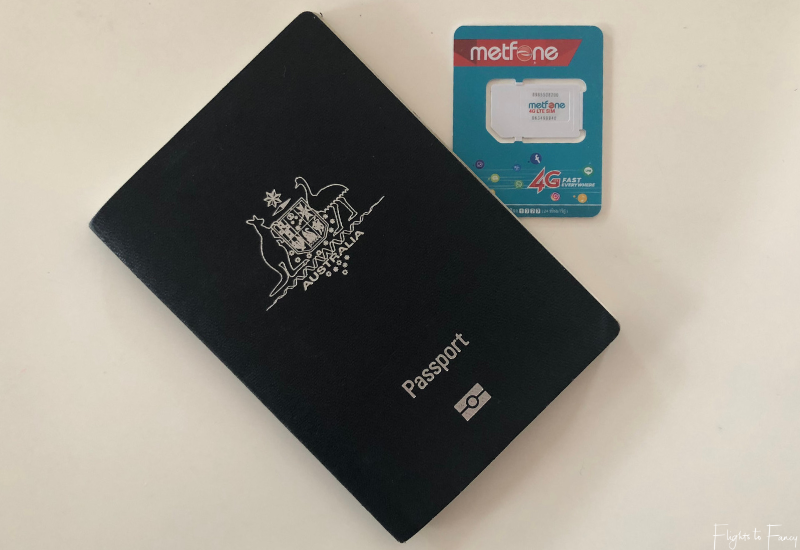 I am not sure if I am right but looks like the whole of South-East Asia, in fact, offers better data cards and the availability of wifi across public spaces is another boon.Metfone offers are much affordable and easy on the pockets. What a delight! I always use Cellcard in Cambodia. More places to buy from, greater coverage, cheaper and more data. Can’t work out why you reached your conclusion, other than the office was opposite your hotel! Just back from a week in Phnom Penh and my 8gb data sim (I use a MIFI unit, so that I can keep my UK number for emergencies and also use Facetime / iMessage) cost me $2!!!!! They also only charge $0.50 for a new sim if I can’t find an old cellcard one. Using 8gb of data roaming on my UK Virgin payg sim would have cost £100,000!!! Interesting! That’s certainly not was is on their website but that’s an amazing deal. What I see beside the plan I have mentioned here is a $1.50 plan that has 1400mb or $3 for 2000mb. We probably could have just about gotten away with the $3 plan but Metfone’s unlimited plan (and the fact it was across the road lol) sealed the deal. We had no problems at all with Cu erase beside that one small outage so I couldn’t be happier. £100,000 is insane! This is a really helpful one for me and comes just at the right time. We are planning a trip to Cambodia in December this year and will be definitely getting a local SIM. And from what I read here, Metfone seems like the clear winner when in Cambodia. We will be in Siam Reap and around for 4 days. So, this fits in perfectly. Thank you so much. Glad I could help Soumya! I am looking to visit Cambodia sometime in 2019 and this post is very helpful. Like you stated these days you can’t think of a holiday without being connected and Metfone seems to be the clear winner when in Cambodia. One of the main reasons would be the high cost of roaming charges and limited data when you are on roaming. I would definitely look to use this provider in Cambodia. Hope you have a fantastic time in Cambodia Amar! Although I am not going anytime soon to Cambodia I think this post is very helpful for all those who are! As you said, its important to stay connected and choosing a local SIM card can be difficult. And thanks to you its now easy! Metfone sound great indeed! I had one horrible experience with a roaming bill and I promised I’d never put myself through that again so I am all for local sim cards! It’s always so convenient to have and makes me feel more secure knowing that I can make a call or access wifi and gps whenever I need it. Especially with these rates, you can’t go wrong! Absolutely Aisha. $6 is an absolutely bargain for unlimited data for a week! Thank you for the great info! I’ve read so much about SIM cards but have never purchased one for travel. I almost always go with an international plan on my phone, but those can really add up when a trip is longer than a week or two. It sounds like SIM cards are usually the better option! Some countries (like the USA) can get decent roaming but for Aussie’s it’s just not really a viable option. When I used to travel less frequently I have used global roaming in the odd occasion for ease but now that travel is such a big part of my life I always use a local SIM to save some pennies. It’s hard to beat unlimited data for a well for $6!